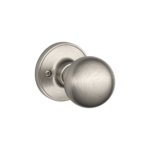 Loose doorknobs or handles is something all homeowners and businesses have to deal with at some point in time. Whether the handle pulls away from the door or jiggles when trying to open it, it’s only a matter of time before it becomes a nuisance for your employees or customers. The good news, fixing a loose doorknob, or one that has completely fallen off, is not too difficult. It becomes wobbly or loose over time and needs to be adjusted and made tight again. It is aged and subjected to buildup of dirt, dust and other pollutants that hinders the operation of the handle or lock. It has a loose or missing screw in the door plate. The door handle’s locking mechanism might be malfunctioning. Fixing the doorknob or handle will depend on its design and how it’s secured to the door and spindle. Using exposed set-screws to secure the handle to a threaded spindle is the most common and oldest way of attaching the doorknob. Older buildings usually have this type of doorknob as well as newer door hardware. It’s fairly easy to tighten up a loose doorknob that has exposed set-screws. You are able to see how the knob is secured to the spindle and how the entire assembly secures to the door. 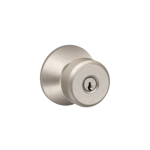 The hidden screw doorknob is a newer screwless fastening method. It involves securing the knob to the spindle and attaching the assembly to the door using hidden screws. A device referred to as detent is used in screwless doorknobs for attaching the doorknob to an unthreaded spindle. The screws are hidden and located underneath a cosmetic face plate. Fortunately, fixing a loose handle or knob is not hard and can be done by following four simple steps once you have determined the types of door knob or handle your company has. If exposed screws are being used, you will have to find the set screw, which is normally found on the inside of the door. Using either a screwdriver or Allen key, loosen the set screw and remove the handle, which will uncover the shaft. If it is a threaded shaft, you will have to twist the shaft’s handle to make it flush with the door. Provide a little space for the knob to spin correctly by backing it up a bit. Then tighten up the set screw. For an unthreaded shaft, you can easily set the knob or handle back on the shaft and up to the door face before you tighten the set screw down. To display the hidden screws, you will have to determine where the detent access hole is when looking at the knob. The detent is a pin that is spring-activated and sticks out of the little hole in the knob preventing it from rotating. When you locate the pin, using a flathead screwdriver, press down on the pin and from the spindle shaft, remove the handle. After you have separated the doorknob from the spindle shaft, remove the base. Carefully pry the ring loose slowly using a flathead screwdriver and avoid damaging the backing plate since it could be destructive to the whole lockset. After you have removed the ring successfully, you should be able to see the set of screws. They run through the door from the inside backing plate into the outside backing plate which holds the whole assembly together. Holding the outside backing plate to keep it from moving, tighten each screw separately. Snap the ring back on the backing plate. You can now put the handle back over the spindle shaft. Once completely on the spindle shaft, turn the handle to line the holes up with the detent and click into place. After following these steps, you find the handle or doorknob is still loose or continues to fall off, it might be time to call us here at Great Valley Lockshop by calling (610) 644-5334, emailing [email protected], or filling out our contact form . We’ve been helping Chester County businesses and homeowners with their locksmith needs since 1973, and we can help you too!